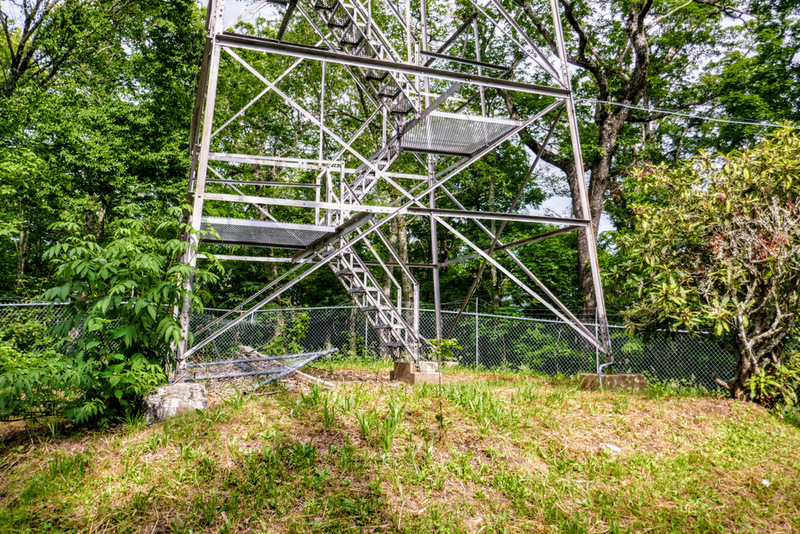 The Barnett Knob lookout tower is one of two remaining publicly accessible towers in the Qualla Boundary of the Eastern Band of Cherokee Indians. 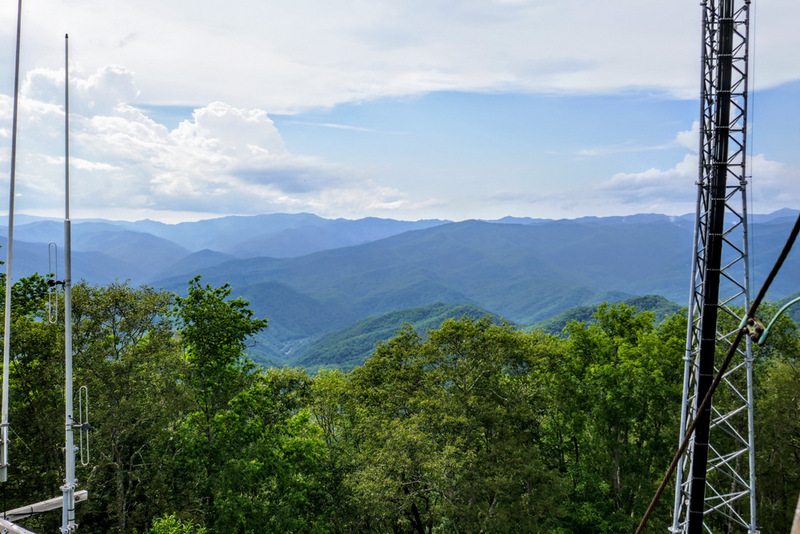 The town of Cherokee sits in the deep Oconaluftee River valley surrounded by imposing spurs of the Great Smoky Mountains. 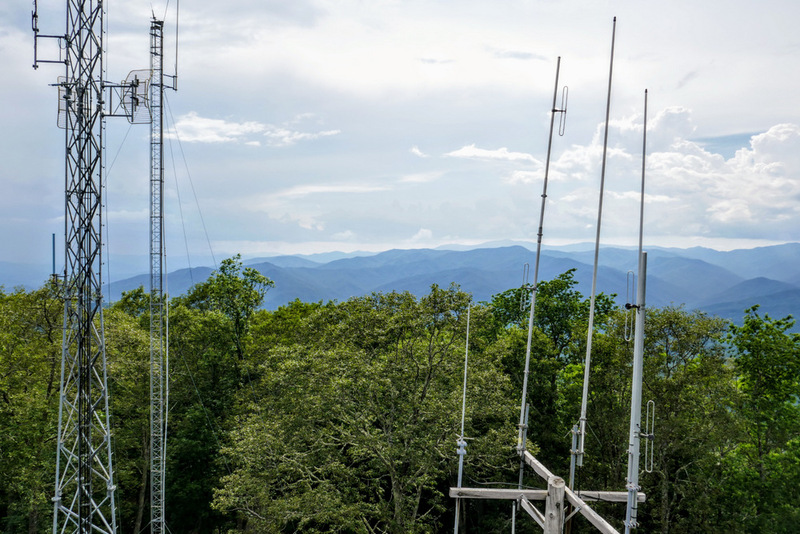 The towers on Barnett Knob and Mount Noble on the east and west valley rim provided bird’s-eye views of forest fires until the early 2000s. 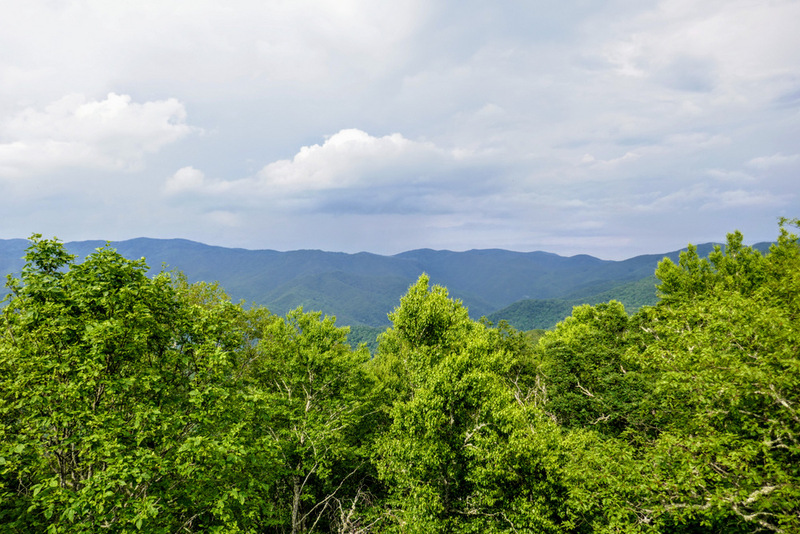 Barnett Knob, the higher elevation of the two peaks at 4,665 feet, is located off of the Blue Ridge Parkway before it begins its final descent to the Oconaluftee River. 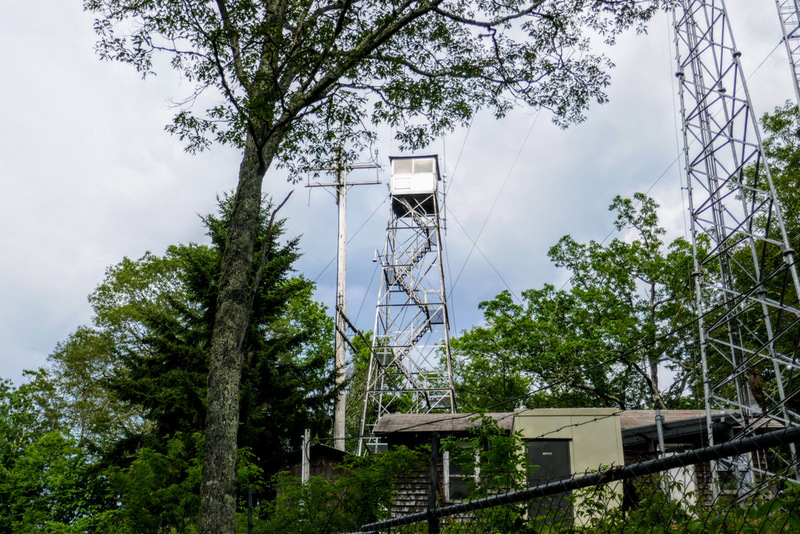 Originally built in 1932, the 60-foot tower remains in very good condition today due to its ongoing use for communications. However, surrounding antenna towers and surprisingly tall trees obscure good views from the stairwell. 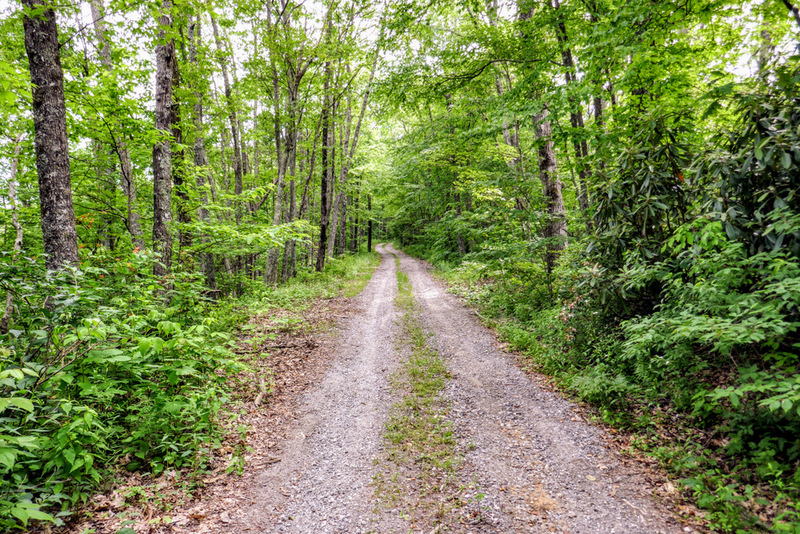 The Blue Ridge Parkway is often closed through this section during the winter, so make sure to check the real-time closures map before you visit. 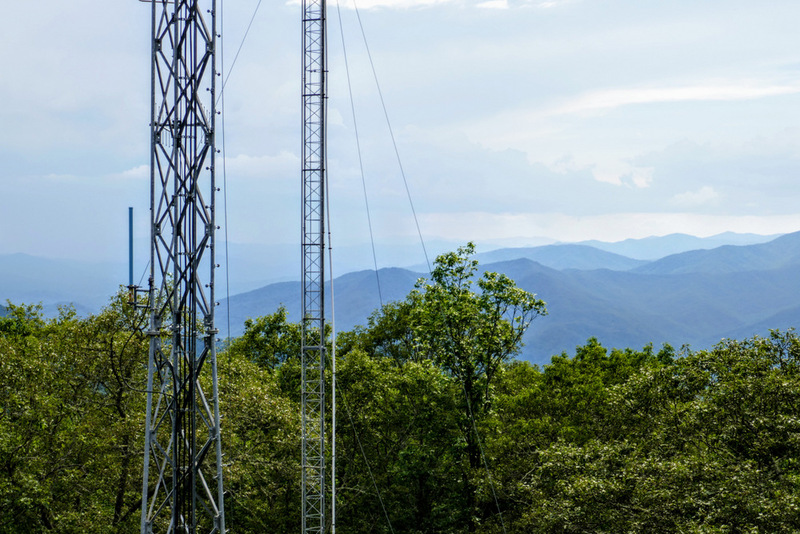 Carolina Lookout Tower Challenge – A minimum 1-mile round-trip hike to this tower is required to complete the challenge for the Carolina Mountain Club. You may find the entrance gate open, but instead of driving up you should park at the gate. 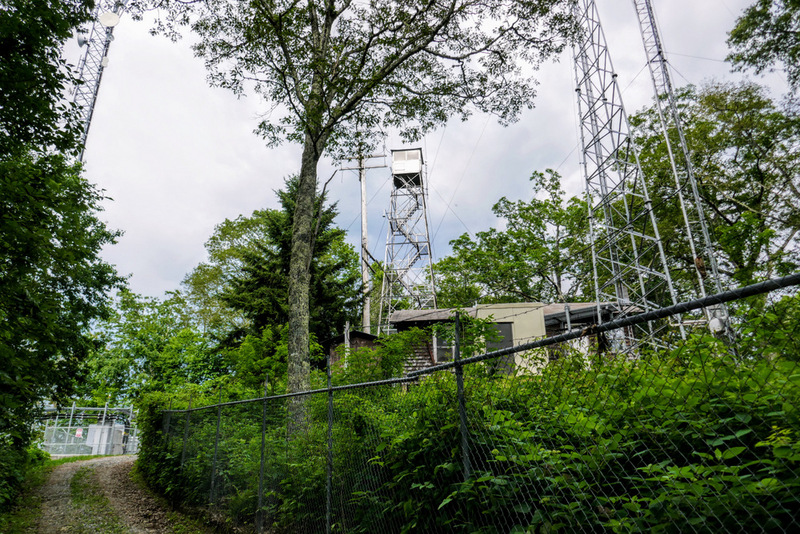 Mile 0.0 – Park at the gate for the Barnett Fire Tower Road/BIA 406 beside the Blue Ridge Parkway. This gate may be open for service vehicles. 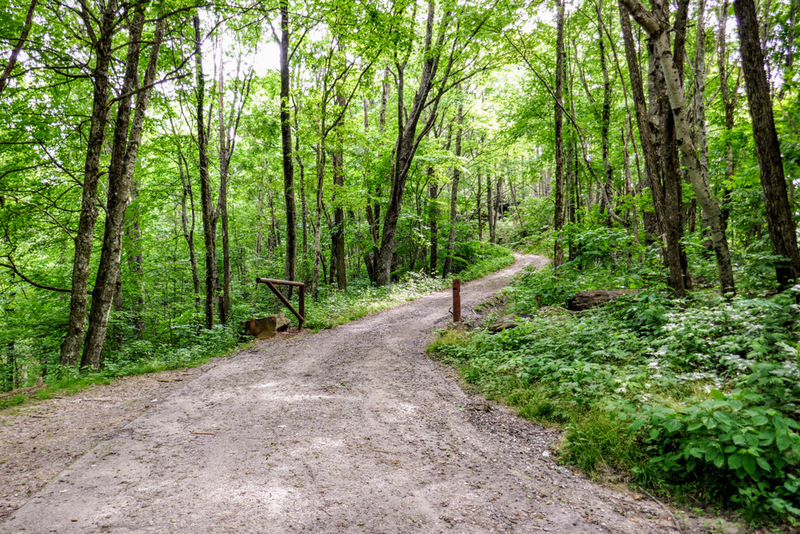 The road is well-graded to the summit. Mile 0.3 – T-junction with Wrights Creek forest road on the left. Mile 0.5 – The road rounds a corner below gated buildings near the summit. 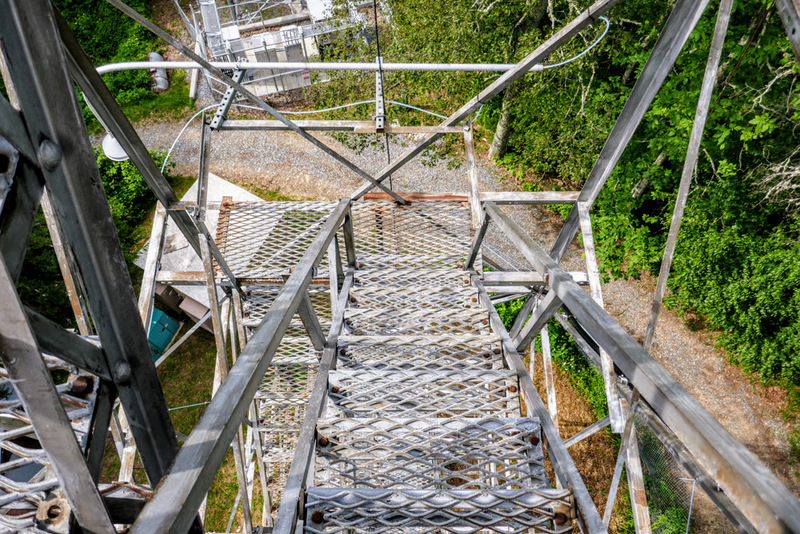 Mile 0.6 – Reach the base of the lookout tower at the summit of Barnett Knob (4,665 feet). The 60-foot steel tower was originally built in 1932 on the highest point. The cab is locked, but you can climb the stairs to get views above the treeline. Multiple towers and tall trees obscure open views in all directions. Due northeast are the high peaks Heintooga Ridge and Cataloochee Divide. Further northeast the tallest peak visible above the treeline is Cataloochee Balsam. Towards the north the massive Mount LeConte dominates the crest of the Smokies. The jagged ridgeline of Charlies Bunion and The Sawteeth are located to the right of Mount Kephart. 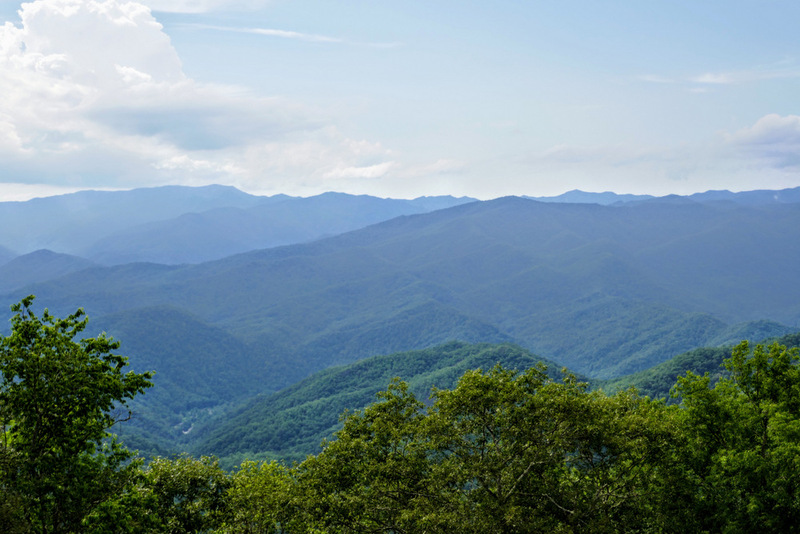 Across the Oconaluftee River valley to the west are the many ridges surrounding the Deep Creek and Noland Creek watersheds. 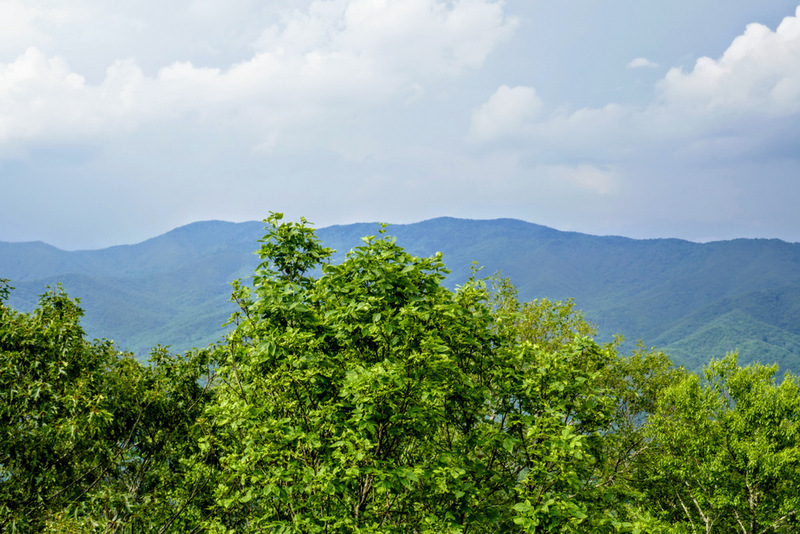 Clingmans Dome and Mount Collins are the tallest peaks in the distant west above Newton Bald. 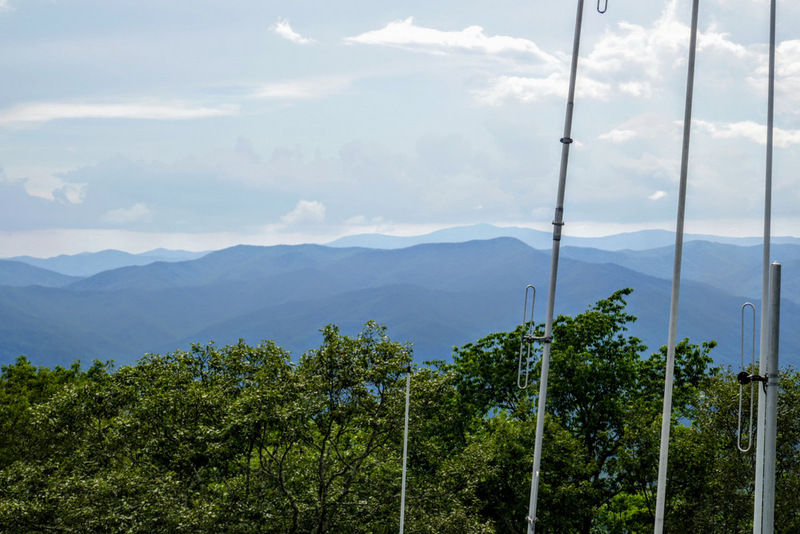 You may be able to pick out the towers on Mount Noble towards the southwest on a clear day. Mile 1.4 – Hike ends at the BIA 406 gate.